Identification: Generally brown in color, 7 to 11 whorls, elongately conic shell shape with several rows of small tubercles (Abbott 1952). Native Range: Native to India west to Japan, south through southeast Asia (Madhyastha and Dutta 2012). Table 1. States with nonindigenous occurrences, the earliest and latest observations in each state, and the tally and names of HUCs with observations†. Names and dates are hyperlinked to their relevant specimen records. The list of references for all nonindigenous occurrences of Tarebia granifera are found here. Ecology: This species is found from a range of environments; large rivers to small springs, in mountains and valleys, and silty or sand bottoms, riffles as well as pools (Abbott 1952; Prentice 1983). It is also found to do well in springs, where the temperature remans warm enough for the snail year-round (Abbott 1952).This species is capable of active upstream migration and is shown to disperse up to 100 m/month upstream (Appleton et al, 2009; Prentice 1983). Densities have been found to be sparse with large animals, or up to 400 specimens per square foot with smaller sized animals and obvious over-crowding (Abbott 1952). It is noted by Appleton et al. (2009) that the species often keeps most of body and shell buried in substrate in both field and in aquarium; this could lead to an underestimation of population proliferation, or an overlook of established populations altogether. 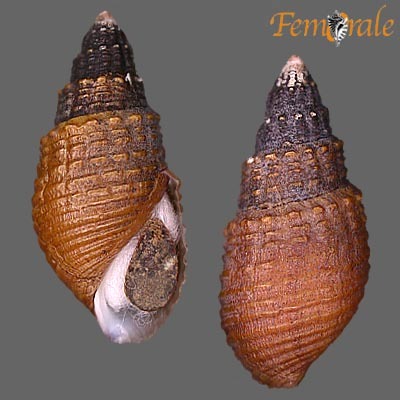 Sexual maturity is reached around 8-12mm in shell height, or typically 6-12 months (Abbott (1952). This species is parthenogenic (capable of self-feritlizaiton), and it is likely that most individuals of introduced populations are female clones, as many researchers have failed to find fertile males; the species is also ovoviviparous, meaning their eggs hatch within the body and live young are birthed (Abbott 1952; Appleton et al. 2009). It has been documented that females can birth one offspring every twelve hours (Abbott (1952). Means of Introduction: Spread through the aquarium trade (Abbott 1952). It is also possible that the species is moved between close waterbodies via waterfowl, as reported by Appleton et al. (2009). This species is known to outcompete, extirpate and replace native snail species, making the species an effective biological molluscicide used to remove native snails that carry parasites (Samadi et al., 1997). This species is a host to the parasite Centrocestus formosanus, which parasitizes fish gills (Appleton et al, 2009). Species has blocked pipes in large industrial plants and ponds in a fish hatchery in introduced areas in Africa, due to its tendency to become very dense (Appleton et al., 2009). Tarebia granfiera was thought to be an intermediate host fo rthe Asian lungfluke Paragonimus westermani, but this is not actually the case; however, this species still hosts other trematode parasites of the family Heterophyidae (Appleton et al., 2009). Abbott, R.T. 1952. A study of an intermediate snail host (Thiara granifera) of the oriental lung fluke (Paragonimus). Proceedings of the United States National Museum 102(3292):71-116. Appleton, C.C., A.T. Forbes, and N.T. Demetriades. 2009. The occurrence, bionomics and potential impacts of the invasive freshwater snail Tarebia granifera (Lamarck, 1822) (Gastropoda: Thiaridae) in South Africa. Zoologische Mededelingen 83:525-536. Prentice, M.A. 1983. Displacement of Biomphalaria glabrata by the snail Thiara granifera in the field in habitats in St. Lucia, West Indies. Annals of Tropical Medicine and Parasitology 77(1):51-59.